Like all mammals, equines have three core needs: food, shelter, and security. In the grasslands of Eurasia where the modern horse evolved these needs were met quite differently than they are for most domesticated horses today. A wild horse lives in a herd, travels many miles each day, grazes constantly, and seeks shelter from whatever the sparse landscape may offer. A domestic horse may live on pasture, in a paddock or in a stall, is fed a set number of times a day, and may or may not live with other horses. In the next three posts I’ll be looking at how we meet our animals’ needs, and the compromises between the ideal and the practical necessary when keeping horses. The horse is designed to spend most of its day eating. 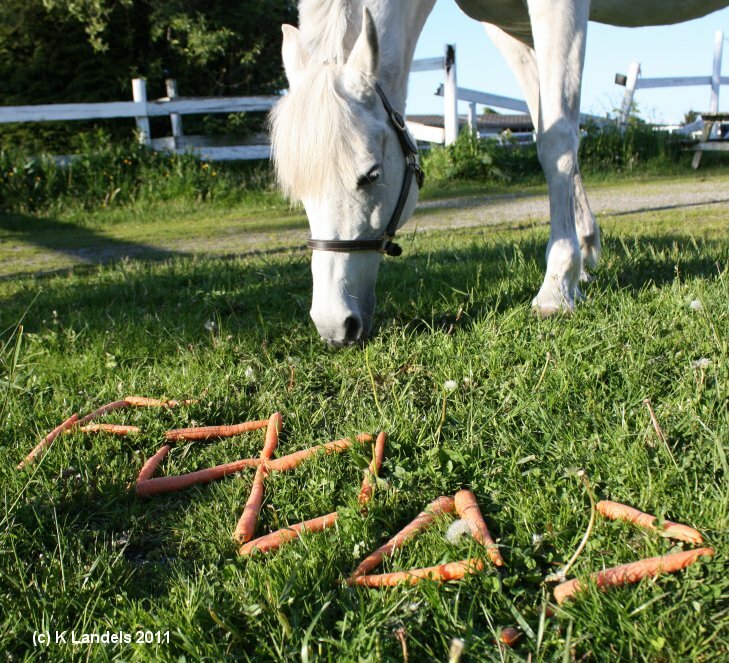 In the wild, forage is often scarce and dry, meaning the horse must cover a lot of territory (thereby getting excercise) and consume a lot of low-calorie food to get enough energy. Our pastures, however, tend to be much smaller, greener and richer, so that a grazing horse gets less exercise and more calories in a day. For some ‘easy keepers’ this is too much food, making the horse fat and prone to laminitis (also known as founder, the inflammation of the hoof leading to separation of the hoof wall from the foot, possible rotation of the coffin bone, and often permanent lameness). A solution to rich pastures is to limit turnout, and feed hay, which is similar in nutritional value and roughage to dry wild grasses. However, a horse kept in a small paddock or stall has even less opportunity to exercise, and will require some kind of exercise: whether by riding, longeing or daily turnout. Hay can be made from grasses such as timothy or brome, or legumes like alfalfa, or a mix. The problem with feeding in a paddock or stall is that we often are only able to feed 2 – 4 times a day, depending on our human schedule. This leaves horses with a lot of downtime to get bored and start chewing on paddock rails or otherwise making mischief. It also leaves their stomachs empty for longer periods of time — a situation they’re not designed for — making them more prone to ulcers. Free choice hay is the ideal for horses who don’t tend to gorge themselves. Small opening haynets can also work well to slow consumption, although haynets can present other hazards, if improperly secured. Aside from the seed-heads of grasses, horses do not encounter grain in the wild. However, a horse that is in heavy work may require more calories than can be obtained by hay alone. Oats, corn and barley are traditional horse feeds, and can be fed whole or ‘flatted’. Because they are high in starch these grains can also put some horses at risk of laminitis or Cushings disease, the equine version of insulin resistance. Grains also tend to make horses ‘hot’, or flighty and energetic, which can be a problem for behaviour and safety. 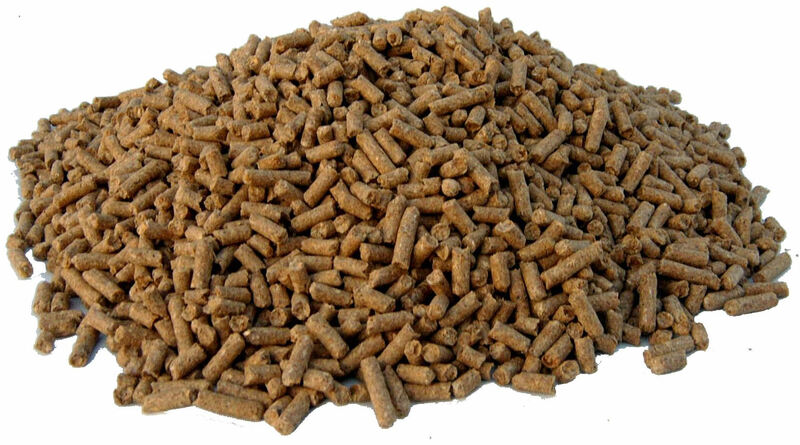 There are many pelleted feeds on the market designed to replace grain. These have the advantage of sometimes being less starchy, and often have added nutrients that can make up for shortfalls in the local pasture or hay. However, they provide even less chewing time than whole grain, and are just as easy to over feed. With all grain, whether whole or processed, the rule of thumb should be to feed the minimum possible and monitor with care. While wild grass is dry, it’s not as dry as hay. Therefore horses who don’t have access to fresh grass can benefit from a succulent feed every day to provide some of the vitamins found in fresh grass. This is something as simple as a single carrot or apple, and is usually offered as a treat or reward. Hay can be analyzed to make sure all the necessary micronutrients are present, and most pelleted feeds are fortified to provide the nutrients such as selenium, zinc, copper, etc. that a horse would normally ingest with its varied diet in the wild. Salt should be provided in the form of a block that the horse can lick at will. However, some horses have no restraint and will consume a salt block in a matter of days, in which case, adding salt to their grain may be necessary. Water is the most vital of all feeds. A horse will drink around 40 litres of water a day; more in warm weather or after heavy exercise. If water in the pasture is provided from a stream it should be clear, fast-moving, and with a gravel bottom to prevent the horse from ingesting sand (which can cause colic). Water buckets or troughs can either have auto-refill mechanisms or be refilled 2 or 3 times a day; and regardless of the refill method should be cleaned frequently and checked at least twice daily. A horse without sufficient water can dehydrate or colic quickly. A further consideration is the condition of a horse’s teeth. Without constant foraging, horses teeth often grow faster than they are worn down, and dental care, as discussed in this previous post, is usually necessary to keep teeth working well. An older horse may need special foods, like chopped hay or mashes to keep weight on. The field of equine nutrition is complex and growing every day, but most horses do quite well with the above five points taken into account. In the Riding & Horsemanship program level 1 participants learn basic feeding and care in lesson 3; levels 2 – 4 expand and go farther into the topic in lesson 1 of the series.